Technology, design and precious details typical of big yachts on a boat destined to set a fashion. Up until recently, the fantasy of designers and the ingenuity of naval architects found rich soil above all in the superyacht sector. Today, ever more often, we note that small and medium size yachts are at the centre of the attention of these inventors and of the shipyards that build them. An interesting example of this trend is set by the Neapolitan Yard Nautica Salpa the technical office of which has few equals in the Italian scene. The boat in question is the Salpa 30 Granturismo, an open yacht that, beyond slogans, features not only many of the technical and design solutions typical of larger cabin cruisers, but also original ones. 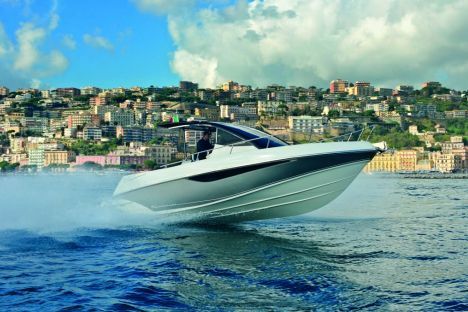 This may be confirmed by the successful hull shape of the famous Salpa 32 Cabinato, designed by Renato Sonny Levi, the sport soul of this new model. The other feature - more cruise-like - is even more conspicuous, since it is the livable area of the boat, starting from the cockpit. Here, two comfortable opposite L-shaped settees line the aft perimeter of the boat, with a convenient passage to the aft platform. Both settees and the respective tables set on supports may be transformed, either combined or independently one from the other, into a large sunpad. Opposite this practical salon, the galley on deck could not be any better on a boat this size. 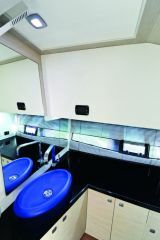 The galley main cabinet supports the forward seats, fitted with a folding backrest. 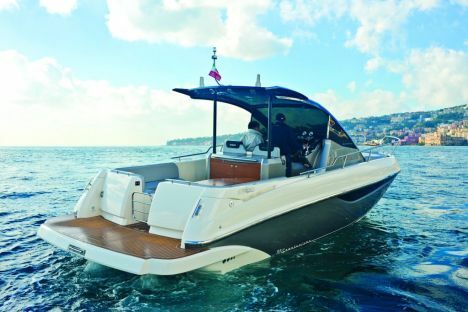 It should be pointed out that this central part of the boat is covered by a refined and showy hard top which, designed as an extension of the windshield, offers of itself an excellent protection from sea sprays and rain, nevertheless it may be further extended aft by a pullout awning. Easy dismantling of some stainless steel elements, such as the useful grabrails, for maintenance and refitting is an original and intelligent solution. The open space belowdecks will set a fashion for its elegance and rational use of space: the living area is very cosy, thanks to the excellent use of natural and artificial lighting that brightens up all corners. Under way, the Salpa 30 Granturismo, propelled by a couple of 200 hp Volvo Penta D-3 with stern drive leg, features a fast yet stable hull, that forgives piloting errors and flaws and that does not need excessive ratings for excellent performance. Planing factor: 2.83 (It is the ratio between maximum and minimum planing speed with no flaps. In practical terms, it is the speed range of the trimmed boat. Factor values: 0-1.95 low; 1.96-2.30 normal; 2.31-3.90 high; above 3.90 very high). For and aft passage minimum width: 0.33 m.
suitable to the hull type. the cockpit is one of the strong points of the boat featuring maximum functionality. Anti-skid deck coating: , Flexiteek (standard) is efficient and looks like teak. another strongpoint of this model: the functional and elegant open space is unexpectedly comfortable. of suitable size for the hull type. excellent example of functional refined design. excellent aft, good forward, slightly impaired by the windshield-top structure. excellent workmanship and functional arrangement of all elements, a part of which is fitted in the adjacent technical area. immediate as it should be with two stern drives. typical of any planing hull with two stern drives.